From the Campus Center for Appropriate Technology, at Humbold University, check the Pedal Power How-to, guides, articles, and examples. Like this pedal-powered washing machine. 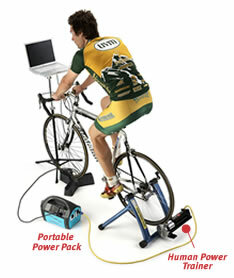 Also see the the commercial HPG and HPT (human power generation and trainer) from Windsteam technologies for all sorts of uses. The last time the lights went out in Seattle, I desperately needed an Espresso machine and so with an HPG, I could just crank that baby up!